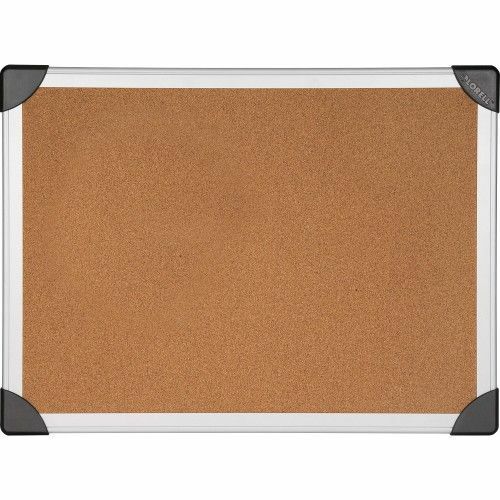 96" x 48" Aluminum Frame Cork Board offers thick, resilient, durable cork laminated to sturdy fiberboard. Push pins, tacks and staples penetrate easily and hold firmly. Back is sealed to prevent warping and provide long-lasting service. Office cork boards are great for businesses to post updates, business news, new benefits, company policy, upcoming events, even pictures of employees and their families. Every employee might like a cork board in their office to post information they don't want to forget, such as meeting times and monthly goals. In classrooms cork boards can show accomplishments of students and fun and educational events. In spaces with hard floors and walls and lots of windows, a cork board's cellular structure gives it significant acoustical benefits. Cork board comes complete with mounting hardware.